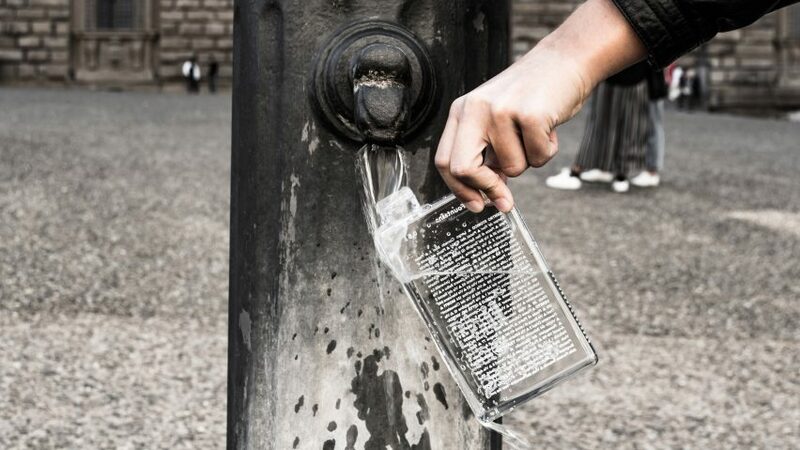 Italian designer Emanuele Pizzolorusso has created reusable water bottles for use in ten global cities that list the locations of public water fountains on one side. The half litre water bottles made from PBA-free plastic resin for Florence-based brand Palomar, have been designed as an alternative to plastic water bottles and to make finding a place to refill easier. "I worked on what I thought would be the best proportion and size to perform the function of carrying half a litre, as well as displaying a certain amount of information. So it needed to be somehow flat and yet easy to hold in one hand," Emanuele Pizzolorusso, founder of design studio Pizzolorusso told Dezeen. Each bottle is an identical shape, and has the name of a specific city written vertically up one edge. Pizzolorusso has designed bottles for Amsterdam, Barcelona, Berlin, Copenhagen, London, Milan, New York, Paris, Rome and Tokyo, and another bottle for Anywhere. "These available sources of drinking water, which are safe because they are highly monitored, are listed one by one with easy to find addresses," said the design studio. For the cities that have many water fountains, such as Rome, Pizzolorusso made a selection of fountains, but for the majority of places he listed all of the available locations. The bottles encourage drinkers to refill with water at designated sites by offering an "amusing invitation", rather than relying on single-use plastic bottles of water. "In many countries, for example Italy, a lot of people still buy bottled water, which obviously has a high environmental impact due to transportation and the disposable usage of plastic," said the designer. Single-use plastics have contributed to huge rubbish patches in the oceans, resulting in initiatives such as the The Ocean Cleanup, that launched from San Francisco in September and aims to clear the Great Pacific Garbage Patch. Recycling plastic bottles is possible, but uses a lot of energy, and single-use plastics are often instead shipped to landfill sites. Many cities are taking measures to reduce our reliance on bottled water, including London where a water fountain by Michael Anasstasiades was unveiled during London Design Festival. Pizzolorusso hopes that the list of available public water sources will encourage us to think of water as a precious resource and its provision in urban centres as a public service. "The list of drinking fountains reminds us that every city has a privileged relationship with water, the most precious and often forgotten public asset," said Pizzolorusso. "Highlighting the drinking fountains in our cities for me was also a way to bring to our attention the fact that we can use tap water in general. In most countries, the water supply is highly secure and often there is no real need to buy bottled water." The designer plans to introduce a bottle for Lisbon next, and to grow the collection "depending on the demands of the market". Earlier this year, ÉCAL industrial design graduate Dimitri Nassisi designed a bright blue drinking fountain with a dog drinking bowl at its base, a tap to refill bottles, and a spout for people to drink from.